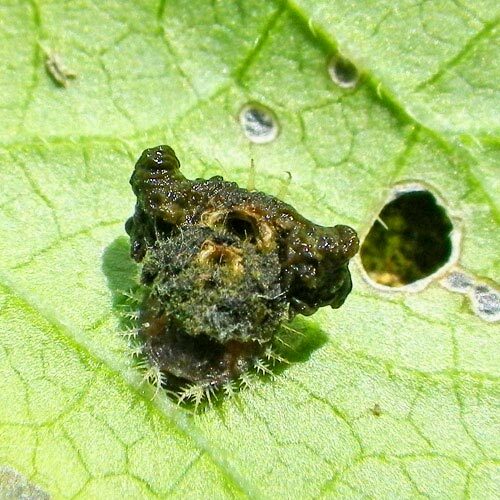 Recently, BugFan Heather asked BugFan Tom to ID an odd beastie that was noshing on her morning glory leaves. BugFan Tom scratched his head and sent the picture to the BugLady, who swung and missed (well, the spines on this larva do look like the spines of some of those toxic, Southern caterpillars). Fortunately, Tom figured it out. 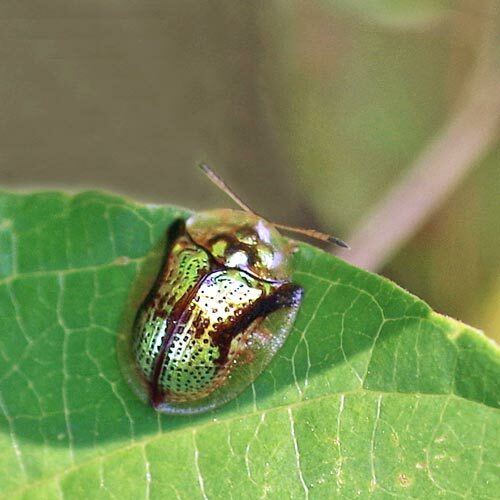 The BugLady has seen adult tortoise beetles, but not their bizarre offspring. Tortoise beetles belong to the Leaf beetle family Chrysomelidae, a huge (1,700+ species in North America alone) and often colorful family that has been well-represented in BOTW (swamp milkweed leaf beetle, klamathweed beetle, cucumber beetle, dogbane beetle, Colorado potato beetle, waterlily leaf beetle, goldenrod leafminer, and more). As their names suggest, this is a bunch of plant eaters who are often very attached to a single species or group of plant species. In order to encompass their diversity, our Chrysomelids are divided into nine subfamilies, and the Tortoise beetle belongs in the subfamily Cassidinae. The BugLady photographed an adult locally, and Tom sent some pictures from south of the Mason-Dixon Line of adults on lacy-looking morning glory leaves. 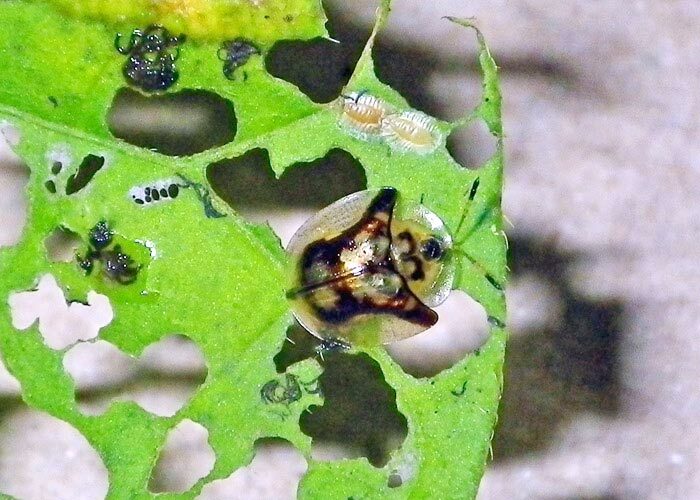 All of the adults appear to be Mottled Tortoise beetles (Deloyala guttata—there’s a lot of variation in color and pattern within the species), and the larvae may be, too. MTBs are found in North America from the Great Plains to the Atlantic and south all the way to Argentina. 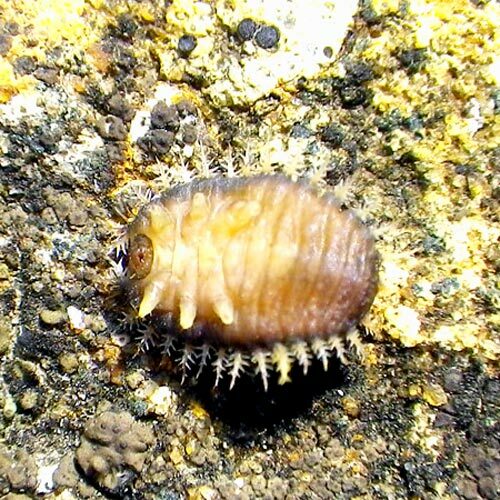 Both the adults and the larvae are a little less than a half-inch long. Cassidines feed on a wide variety of plants, woody and non. A number of species of TBs, including MTBs, specialize on the leaves of members of the Morning Glory family Convolvulaceae as larvae and adults. Though they confine their nibbling to the soft tissues and eschew the leaf’s veins, they cause the sort of damage that gets gardeners excited. Most sources agree that if the plants are hardy, MTBs do not generally damage sweet potato yields significantly and no chemicals need be applied, but Morning glory fans don’t like the “see-through” leaves. While they are unwelcome on domestic plants, it is hoped that TBs will be an effective biological control on that lovely Eurasian invasive, Field Bindweed, which overgrows native plants in grasslands and which has a really extensive root system that can slurp up the lion’s share of available soil moisture. MTBs are preyed upon by the usual suspects—damsel, stink, and assassin bugs, ladybugs, and parasitic wasps. Here in God’s Country, there is a single brood of MTBs, though there are multiple broods in the South. They overwinter as adults in the shelter of leaf litter or under tree bark, emerging in late spring to mate. 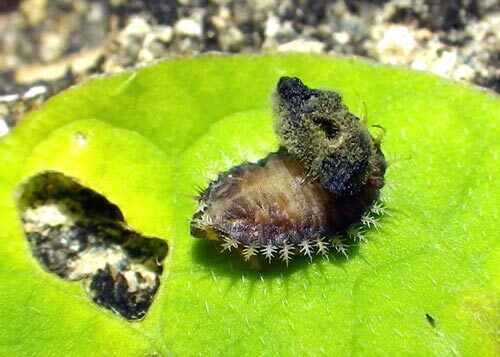 Their stalked eggs are deposited in clutches on the undersides of the leaves the larvae will feed on, and even the spiny pupae glue themselves to leaves. A new generation of adults, abroad by late July, feeds briefly before tucking themselves into some protected place and entering the state of diapause (system shut-down) until the following spring. Bugguide.net has a great series of pictures of the life cycle. It’s a movable defense system. As Eisner points out in Secret Weapons, many animals consider feces to be “hazardous wastes” that may carry germs or parasites, and in addition, the shields of some species of TBs contain chemical repellants that the larva gets from its host plant. The larva can angle its shield toward its predator or shelter its whole body like an umbrella in order to block an attack. Eisner says that this defense only works on smaller critters like ants and spiders; larger insects with piercing mouthparts are undeterred. Expanded, often transparent, edges on the prothorax (the first segment of the thorax) and the elytra (wing covers—yes, there is a set of flying wings folded up under there) hide the head and legs and contribute to the adults’ odd, turtle-like appearance. According to the National Audubon Society’s Field Guide to North American Insects and Spiders, an alarmed Clavate TB (Deloyala clavata) will pull its antennae in under its shell, and other species are known to do it as well. The smooth, hemispherical shape of a TB, with no visible appendages, gives prospective predators nothing to get a grip on. Eisner also discusses a unique defense system used by the Palmetto TB (Hemisphaerota cyanea). Many Chrysomelids have bristly feet, but the Palmetto TB has taken bristles to a whole new level. Its tarsi are covered by mini-bristles, all with split ends that end in tiny pads. Bristles times two. Approximately 120,000 pads per beetle. An alarmed PTB wets the bristles with oil that it manufactures and presses its feet/pads down to stick itself to its substrate. Think, says Eisner, of the adhesive power exerted by a single drop of water between two glass slides. The home-made adhesive is so strong that it takes a force 60 times the weight of the beetle to dislodge it (the beetle has only to roll its feet off the substrate to start moving again). To avoid sticking with every step, the PTB’s normal gait is a “tiptoe.” The wheel bug, a large, handsome assassin bug that preys on TBs, solves the suction problem by injecting its prey with a paralyzing chemical that keeps the PTB from tightening its muscles. One last thing about TBs. Several sources refer to the ability of some TBs (but not the MTB) to change colors. TBs attain their full color intensity by the time they reach reproductive maturity, and they lose it after they die and dry out. Age and season of the year may dull their colors. Because of textures in the layers below the cuticle, TBs can look different depending on which angle you view them from (structural color—life is physics). But some, like the Golden TB (formerly Metriona bicolor and now Charidotella sexpunctata), can change colors intentionally. Not to match their surroundings, but they can switch back and forth between pre-set colors. Beneath the transparent cuticle lies a layer of grooved tiers. Depending on whose book you read, either the beetles are pumping in/draining out a pigment that changes the way light is reflected off the tiers, or the beetles are adding/subtracting minute quantities of moisture below the cuticle, and that hides or reveals the base color below by causing light to be reflected differently. Whew! At rest, GTBs are gold; when stressed, they change to orange with black spots and then to a drab, spotted brown (researcher Edward Barrows suggested that they are disguising themselves as foul-tasting ladybugs). Like a walking mood ring. Males can switch faster than females and are, interestingly, gold while copulating.